Finally, the day that casual and die-hard football fans alike have been waiting for. The two best teams in the National Football League, the New England Patriots and the Seattle Seahawks, battle it out in Super Bowl XLIX (49) to be crowned champions of the world on Sunday, February 1. The two number one-seeded teams in the playoffs, both teams were the heavy favorites to represent the AFC and the NFC in the Super Bowl. But that wasn’t always the case, as earlier this season, many claimed that neither of these teams were even playoff material. After an embarrassing 41-14 loss to the Kansas City Chiefs in week four, everyone said that Tom Brady and the Patriots were done. How did they respond? By going on a seven-game win streak and ending the year 10-2 to finish with an overall record of 12-4 and the number one seed in the AFC. Everyone on the team, especially Rob Gronkowski, took their game to a new level, which led them here. Meanwhile, the Seahawks, the defending Super Bowl champs, were only 3-3 by week seven. It looked as if the Arizona Cardinals, who were in the lead of the NFC West with a record of 10-1 at one point, would take the division. Heck, some said the Seahawks would not even make it to the playoffs. How did they respond? By winning nine of their last ten games (their only loss coming against, ironically, Kansas City) to finish the year 12-4 and with another division title, along with the number one seed in the NFC. The Legion of Boom, Seattle’s infamous secondary, stepped up to once again become the most fearsome defensive unit in the league. Marshawn Lynch elevated the offense with his incredible running. This led the Seahawks to where they are now. 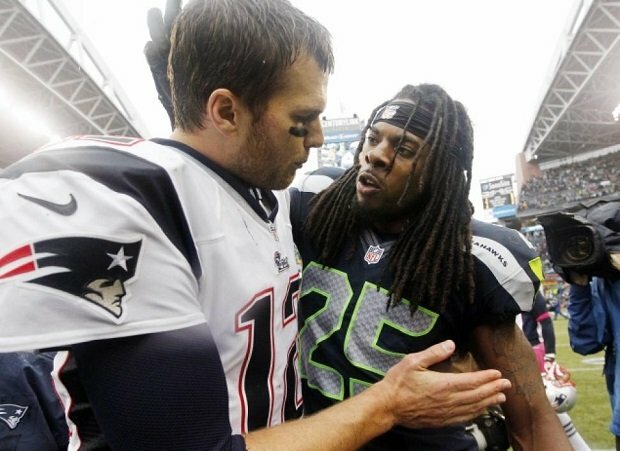 Many will say that the most exciting matchup will be future Hall of Fame QB Tom Brady against Richard Sherman and the Legion of Boom, and it just might be, but it may not be what decides this game. No, in a “passing” league, the run game will be what decides this game. It will be won in the trenches. Since that’s the case, it would be safe to bet on the Seahawks, right? After all, behind Lynch, Seattle had the number one ranked rushing offense in the league. Their rush defense was third overall in the league, allowing only 81.5 yards per game. The Patriots were 18th in rushing offense and 9th in rushing defense. The Seahawks win the battle of stats, so they HAVE to win the game, right? Sure, from a statistical standpoint alone, it seems Seattle has the advantage. But consider this – in their two playoff games against the Carolina Panthers and Green Bay Packers, Seattle allowed an average of 133.5 rushing yards. In their regular season, Seattle faced rushing offenses ranked 20th or worse seven times. Against rushing offenses ranked higher than 20th, Seattle allowed nearly 100 rushing yards per game. The Patriots had 177 rushing yards in their blowout against the Indianapolis Colts last week (and no, we are NOT going to get into “Deflategate”), but only 14 rushing yards against the Baltimore Ravens a couple of weeks ago. Even with virtually no run game, New England still came out on top. It means that Seattle may not have the advantage that you think. New England boasts a tremendous run game, due to the fact that they have a wide array of weapons for their backfield. LeGarrette Blount. Stevan Ridley. Jonas Gray. Shane Vereen. With so many running backs and so much versatility, it’s no wonder the Patriots have such an effective run game. They’ll need it too, as they’ll be going up against the best pass defense in the league. Sure, the Patriots have plenty of sure-handed guys like Julian Edelman, Brandon LaFell and Danny Amendola. But they’ll need to get one guy involved in the passing game in order to have a chance, and we all know who that is: Rob Gronkowski. Gronk will have his hands full, going up against a unit that’s allowing an average of only 185.6 passing yards per game. But throw stats out the window with this guy – he’s Rob Gronkowski! His presence alone makes an impact on this offense. Not only is he nearly an unstoppable threat when going out as a receiver, but he has stepped up as a blocker as well. The Seahawks will need to place someone such as Kam Chancellor on him if they hope to contain him. The Seahawks might have a lot of trouble throwing the ball, as they boast one of the worst passing offenses in the league. Russell Wilson is coming off a four interception performance against Green Bay, but made all the right throws in the final two minutes. Wilson was fortunate to have his defense (and Green Bay’s blunders) continuously bail him out last week. New England will not make the same mistakes Green Bay did. The Patriots will take advantage of any and all mistakes the Seahawks make. Wilson will need to have an error-free game if he hopes to lead his team to a second straight Super Bowl. All in all, this game could go either way, but it will not be a blowout like last year’s Super Bowl. Super Bowl XLIX pits one dynasty that could be near its end against what could be a new dynasty. It’s sure to be a fun and exciting game, one that might just go down as one of the greatest Super Bowls of all time. Kevin Durant Withdraws From Team USA? MASSIVE FIGHT PREVIEW: Can Fury dethrone Klitschko this weekend?